Ableton recently revived the next generation of Push alongside Live 9.5 – a free update that brings many new features, functions, instruments, sounds, and new technology called Link that allows you to connect multiple instances of Live and a growing collection of iOS apps over a wireless network. One of the most stand-out improvements of Live 9.5 is the redesigned Simpler instrument. Live’s powerful but easy-to-use sampling instrument has been completely overhauled with a new interface, along with some impressive feature upgrades including the capability of warping and slicing samples, three different playback modes, additional context menu options, and new analog-modeled filters built in conjunction with Cytomic. Let’s explore the new Simpler further and check out what this impressive update has to offer. Simpler is a sampling instrument that integrates the basic functions of a traditional sampler with a set of classic synthesizer parameters. 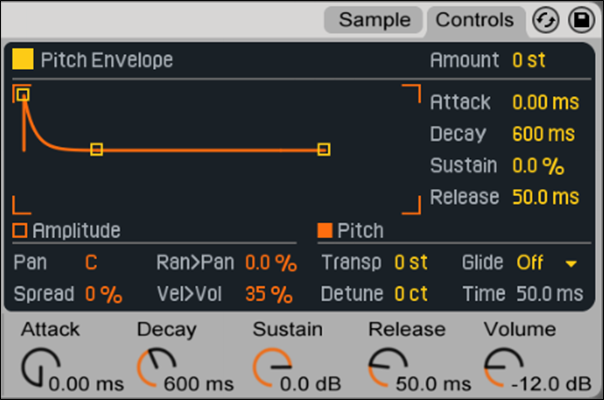 It is a simplified version of Live’s more advanced Sampler, which is a multisampling instrument that has an extensive internal modulation system. Although Simpler is capable of playing multiple samples at once, it’s mainly used to play one-shots or loops that can be processed by envelope, filter, LFO, volume, and pitch functions. 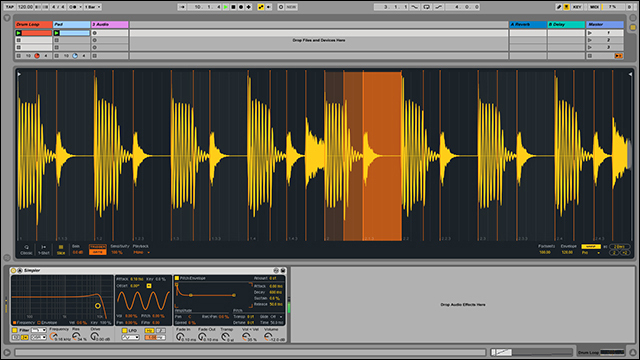 Unlike other conventional sampler instruments, Simpler also includes some unique functionality inherited from Live’s clips such as sample warping and slicing capabilities, trigger options, various playback modes, and more. 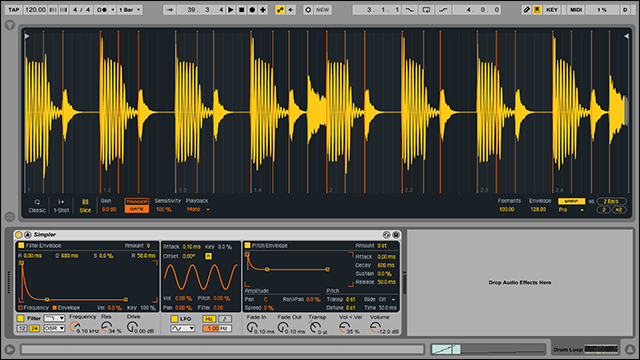 Simpler’s new interface is divided into two sections: Sample and Controls. These two sections can be toggled from the tabs located in the upper-right corner of Simpler’s title bar or expanded to Live’s main window by clicking the small arrow button located in the upper-left corner of the title bar. This new display option is great for getting a closer look at the sample waveform and controls. The Sample Tab displays the sample waveform, new playback modes, and hosts a whole new set of functions. Samples can be loaded into Simpler either directly from the browser, or from the Session or Arrangement View in the form of clips. This means that any adjustments made to a clip’s Warp Markers and other warping properties will be retained when dragging a clip into Simpler. This new capability is amazing and saves heaps of time! For example, if you drag in a warped drum loop from the Session or Arrangement View it will play back the sample in sync with your current song tempo, regardless of which notes you play. In the previous version of Simpler, longer samples often played back out-of-sync and at different speeds when transposed. We will look into this further later on when exploring the different playback modes and Warp controls. Also, you can replace samples by dragging in a new sample, or by activating the Hot-Swap button in the lower-right corner of the waveform display. The most important parameter that determines how Simpler will treat samples is the Mode Switch found on the left side of the Sample tab or along the bottom of the expanded Sample View. The Mode Switch allows you to choose one of the following three playback modes. Classic Mode: This is the default mode when using Simpler, and is optimized for creating “conventional” melodic and harmonic instruments using pitched samples. It features a complete ADSR envelope and supports looping, allowing for samples to sustain as long as a note is held down. Classic Mode is polyphonic by default. One-Shot Mode: This mode is exclusively for monophonic playback, and is optimized for use with one-shot drum hits or short sampled phrases. It features simplified envelope controls and does not support looping. By default, the entire sample will play back when a note is triggered, regardless of how long the note is held. Slicing Mode: This mode automatically and non-destructively slices the sample so that the individual slices can be played back chromatically. You can adjust how sensitive Simpler is to transients, and also manually adjust, delete, or create slices. This mode is ideal for working with rhythmic drum breaks. The most exciting upgrade to Simpler is the new warping capabilities. Simpler now has all the warp functions found in Live’s Clip View such as a Warp activator switch, Warp Modes chooser, Halve/Double Loop Length buttons, and granular resynthesis parameters. If you’re familiar with how warping works in audio clips, you’ll find that Simpler’s Warp Modes and settings behave in the same way. Let’s further explore how the new warping capabilities work. When the Warp switch is off, Simpler behaves like a “conventional” sampler, meaning that when a sample is played back at different pitches, it will also play back at different speeds. In some cases, this is exactly the effect that you may want. However, when working with samples that have their own inherent rhythms such as drum loops or other loop sequences, you may want to enable Warp so that the sample plays back in sync with your current song tempo, regardless of which notes you play. For example, you could load a chord progression sample into Simpler, Warp the loop so that the chords are in sync with the tempo, change the Warp Mode to Complex to maintain the sample’s original tonal quality when transposing notes, and then record a new chord progression pattern playing only single notes. I’m extremely excited to see the new possibilities people come up with using the new Simpler. While playing with the Warp Modes in Sample View, I started experimenting with an interesting idea to create some wild sounds. I loaded up a Simpler piano preset, switched to Classic Mode, and enabled Warp. Then I played with the Loop and Length controls to get a sound that would play, loop in a small region, and repeat every 1 bar. Next I dropped in the Max for Live LFO device and mapped it to the Sample Start control. After creating a new clip with a single note playing a 1 bar loop, I adjusted the filter envelope and played with the LFO settings to get a sound that was always changing. Lastly, I hit record and started shuffling through the different Warp Modes. Each Warp Mode had a different sound that added more complexity to the recording loop in addition to constantly moving Sample Start. The Controls Tab displays sections to control the Filter, LFO, and Pitch Envelopes. These sections offer a variety of parameters used to shape, modulate, pitch, and change the tonality of a sample. Simpler’s filter section offers a variety of filter types including lowpass, highpass, bandpass, notch, and a special Morph filter. The filter section’s display area can be toggled between showing the Frequency Response display or Filter Envelope display. In addition, each filter can be switched between 12 and 24 dB slopes. This section also introduces a Drive control to add distortion and new analog-modeled filters developed in conjunction with Cytomic that are based on classic vintage hardware models. The emulated circuit behaviors will self-resonate, feedback, and distort similar to hardware filters found on some classic analog synthesizers. Let’s look at the new filters below. Clean: This circuit option is a high-quality, CPU-efficient design that is the same as the filters used in EQ Eight. OSR: This circuit option is a state-variable type with resonance limited by a unique hard-clipping diode. It is modeled on the filters used in a somewhat rare British monosynth and is available for all filter types. MS2: This circuit option uses a Sallen-Key design and soft clipping to limit resonance. It is modeled on the filters used in a famous semi-modular Japanese monosynth and is available for the lowpass and highpass filters. SMP: This circuit is a custom design not based on any particular hardware. It shares characteristics of both the MS2 and PRD circuits and is available for the lowpass and highpass filters. PRD: This circuit uses a ladder design and has no explicit resonance limiting. It is modeled on the filters used in a legacy dual-oscillator monosynth from the United States and is available for the lowpass and highpass filters. 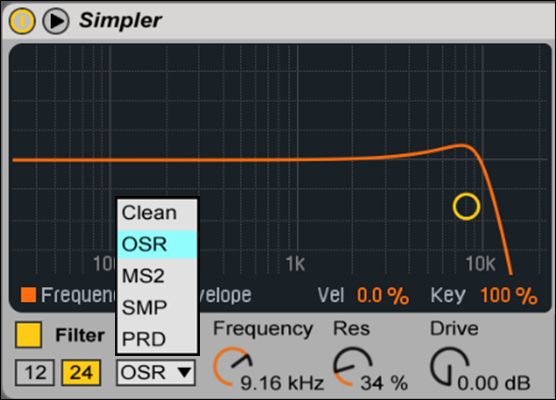 Simpler also offers three classic ADSR envelopes for shaping the dynamic response of the sample. Amplitude, filter frequency, and pitch modulation are all modifiable by toggling their respective buttons in the envelope section. The envelopes can be controlled by adjusting the Attack, Decay, Sustain, and Release controls. These parameters can also be adjusted graphically, by dragging the handles within the envelope visualizations. In addition, the influence of envelopes on pitch and filter cutoff can be set using the Amount controls located in the top right of each of these sections. 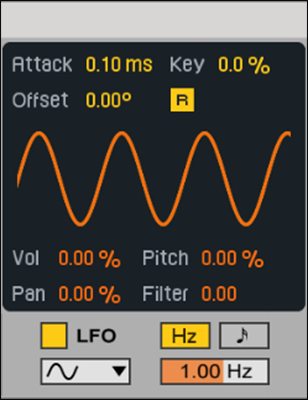 The LFO section offers sine, square, triangle, sawtooth down, sawtooth up, and random waveforms. The LFO can run freely or synced to various divisions of the Set’s tempo. The behavior of the LFO can be controlled by adjusting the Attack control to set the time required for the LFO to reach full intensity while the Key parameter scales each LFO’s Rate in proportion to the pitch of incoming notes. The Volume, Pitch, Pan, and Filter sliders determine how much the LFO will modulate the volume, pitch, pan, and filter, respectively. Live 9.5 also introduces a few additional context menu options such as Reverse, Normalize Volumes, and two other menu options when working in Slicing Playback Mode: Slice to Drum Rack replaces the Simpler with a Drum Rack and loads each slice onto individual pads. Slice to New MIDI Track creates an additional track containing a Drum Rack rather than replacing the current Simpler. Additionally, when slicing to a new track, a clip is created that plays back the slices in order. The Live 9.5 update packs some amazing workflow enhancements and improvements. The redesigned Simpler is a huge upgrade, and will certainly inspire creative experimentation. I’m extremely excited to work with the new features and discover even more possibilities.